We announce a new contract for the United Nations Office for Project Services (UNOPS). The agreement will see us mobilise two Multi Task Teams to South Sudan in support of the United Nations Mine Action Services (UNMAS) in Juba. The end of 2014 also saw our teams complete a four month contract with UNOPS for UNMAS providing basic First Aid training to over 2,800 personnel from UN troop-contributing countries in Mali. The training of potentially lifesaving first response protocol was delivered by six experienced Medical Trainers to peacekeepers from countries including Chad, Guinea, Senegal, Cambodia, Nepal, Bangladesh and Niger. The training, delivered in the northern Malian regions of Gao and Kidal, was required following the increase in attacks on MINUSMA peacekeeping troops. 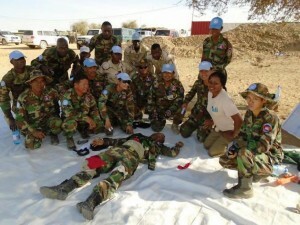 Each peacekeeper completing the training was also provided with an Individual First Aid Kit (IFAK). Commenting on the South Sudan contract win and the completion of the training in Mali, Hugh Morris, Managing Director, said: “This contract win in South Sudan is testament to our long-standing relationship with the UN and the successful delivery of numerous similar projects in the region. As ever, the end goal of this latest project is the removal of ERW and the empowerment of local communities by clearing the way for future development”. The project in South Sudan has been mobilised.